Penny by Ellie Keaton, review. Book one in the Violette Szabo theme. 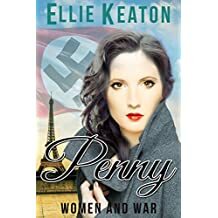 Book one in the Violette Szabo theme is: Penny By Ellie Keaton. I will also be posting a Q&A with the author today. I picked this novel due to it centring around a female spy & my personal fascination with the female spies of the SOE. The novel opens up & we are instantly engaged with the relationship between Penny and her Grandmother Meme. Their relationship is extremely relatable as a reader. As many readers of my generation grew up with tales of the war from their grandparents (I know I did). Their relationship has its issues may they be cultural (French/English) or due to a class divide (working/upper class). Never the less, Penelope & Meme learn to put their differences aside. As the novel progresses the reader is well aware the effects & repercussions of ww1 are still being felt within society. Yet we are also aware that war is upon the horizon. The novel has so many themes and to detail them too much would in effect ruin the novel. So I shall merely list them, the novel features: rationing, SOE, Guinea pig club, POW’s, evacuation, land girls, French occupation, collaboration with Germans, devastation of the blitz, revenge, betrayal, soldier’s injuries and the dangers posed to British spies in occupied France. The relationship between Penny & Meme progresses and we see that for Penny the war provides a ‘coming of age’ moment & she may live a freer existence than women previously have done so. Penny is very similar to real-life Spy Violette Szabo, in many ways and the novel details the importance of female spies in ww2. There are moments of happiness, love & hope. This novel would hugely appeal to fans of Josephine Cox or Lesley Pearse. That being said the novel has its dark gritty moments & I couldn’t read the last 10% quick enough. The ending is haunting & has the reader well & truly hooked! Next Next post: Q&A with author Ellie Keaton. Part of the Violette Szabo remembrance theme.